We recently attended the annual RSA tradeshow. This was a great chance to meet with customers and also with our suppliers. We took some notes on early previews of several different skates that we’d like to share. None of these are available yet, we don’t even really have any guarantees that all of them will eventually become real. We certainly don’t have prices or firm dates yet. But, with those disclaimers, here are some of the highlights on items we saw. . .
Several new versions of the Candi Girl skates. One of the more interesting ones was a smaller skate, with adjustable sizes, for the younger skaters. 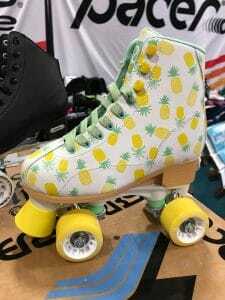 It had a white boot, with pineapple designs printed on them. They also showed a couple of new colors of the U772 and U774 versions of the Candi Girl, and hinted that some of the current colors might be phased out to make room for the new versions. Roller Derby also showed several new designs for the Heart Throb skates. Instead of a graffiti design, these will have geometric pattern designs on the boots. For the GT-50 skates, a version with a bolder look, with a glitter pattern similar to what’s on the Stardust skates. A clear tinted quad speed wheel called The Ice (this one is almost certainly happening, coming in the fall). They had two different quad speed skates with boots that were heavily influenced by skateboard shoes that should appeal especially well to the younger teen market. They’re thinking about offering the poms in different sizes. A lot of rinks don’t use poms anymore, but the ones that do seem to do very well with them. Again, we don’t have prices, dates, or any firmer details on any of these items. But as soon as we do we’ll be sure to let everyone know.